Regardless of whether you’re still thinking of buying the Canon SX40HS or you already own the camera, nothing beats reading the owner’s manual cover-to-cover to get a comprehensive understanding of operating the camera, camera settings, features and the available range of functionality. Canon PowerShot SX40 HS – Camera User Guide – 12.9 MB, 220 pages. 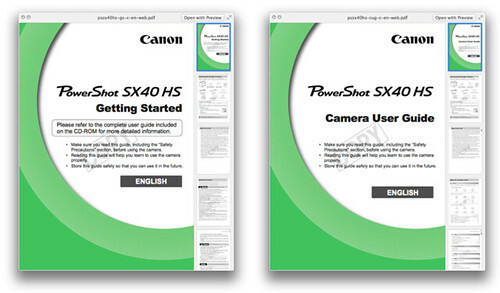 Canon PowerShot SX40 HS – Getting Started – 2.3 MB, 36 pages. If the direct download links didn’t work for you, visit Canon USA’s official Brochures & Manuals page for the SX40 HS and download from there. On a personal note, I’m disappointed to find, on page 84 of the Camera User Guide, that the macro mode only works from the end of the lens at maximum wide angle. The reproduction ratio (how large the subject appears in the final photo) would be pretty poor too, something to consider if you like snapping pictures of bugs or very tiny objects.